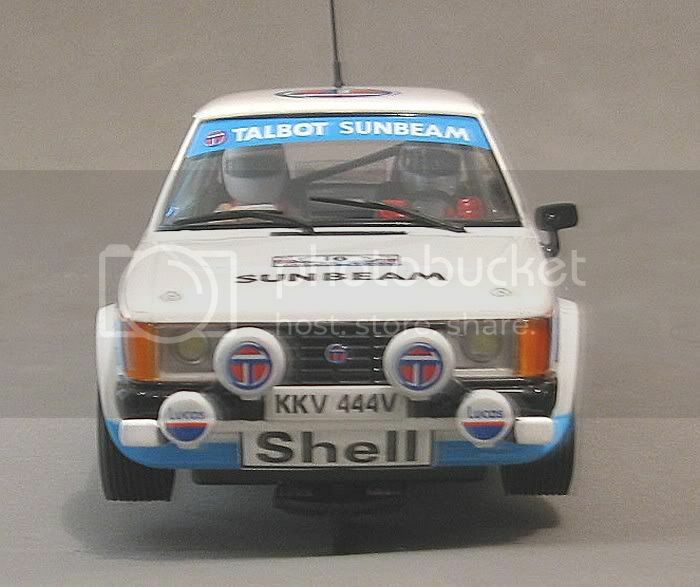 Talbot….. Sunbeam……? Sunbeam……. Talbot????? Just a jumble of names to the uninitiated ??? Strange and not even enigmatic names which go back way beyond most of the readers lives. 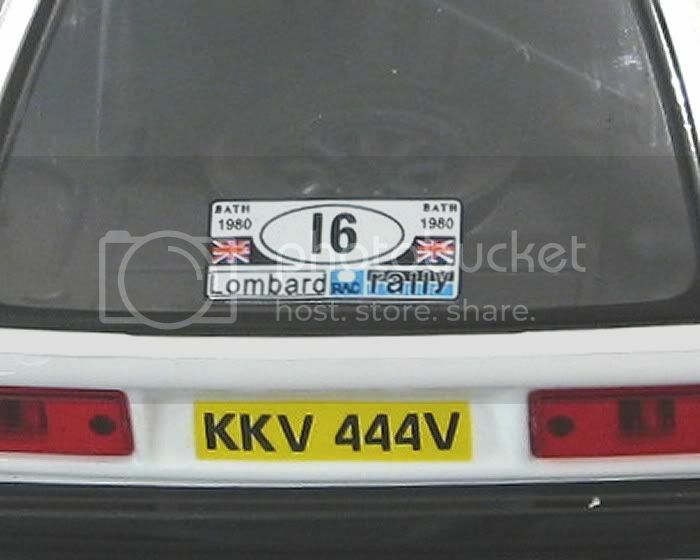 In brief, Talbot was a British motor company dating back to the early nineteenth century. They were taken over by the British controlled French company Darracq by 1919 . Nothing momentous really came from their factory and by 1920 they had merged with the Sunbeam company who produced prestige cars from the turn of that century. Sunbeam were also the builders of some of the early land speed record holding cars, one in particular being the first ‘Bluebird’ in which Sir Malcolm Campbell took the World Land Speed record firstly to 142 mph and then to 150 mph. A little while later, Sir Henry Seagrave took a 4 litre 12 cylinder Sunbeam to 152 mph and by 1927 he raised it again to 200 mph with a 1000 hp twin engined monster! By the mid 1930’s, the depression had caused Europe to thin out its mass of auto builders and the hapless Talbot Sunbeam company was swallowed up by the then financially strong British Rootes group, manufacturers of the Hillman and others. 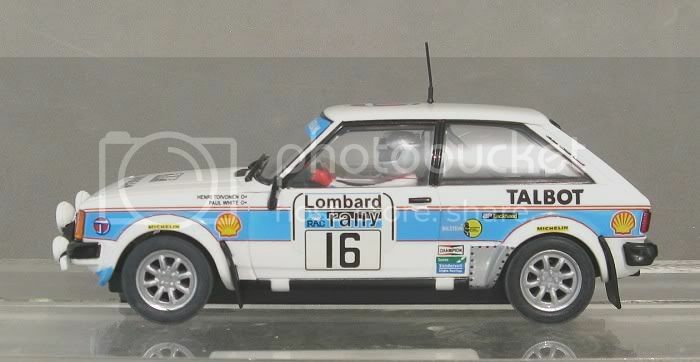 At this point, Italian, Anthony Lago, who was on the board of Sunbeam, took the French Talbot operations in a different direction where motorsport was part of the ethos. Meanwhile, the Rootes group survived the war years and in a new post war era set about producing viable cars for the masses. Eventually, the name Sunbeam and Talbot were dropped from the Rootes brochures and left to languish as brand names only. Finally Rootes succumbs to a shrinking global market and Chrysler where to become the new owners. In France, the Talbot company set up by Lago was also in decline and was eventually acquired by the French Simca company. Simca later also became an acquisition of Chrysler and then everything had gone full circle. After pumping millions into the companies (and others) Chrysler itself was to become the victim of the global market place and by the late eighties was bailing out of global auto commitments across the globe. At this time Chrysler UK had been working on a new hatch model based on the old Avenger floor pan. This was to be the Sunbeam Talbot. Chrysler UK was dissolved and Sunbeam (Rootes) was up for sale. 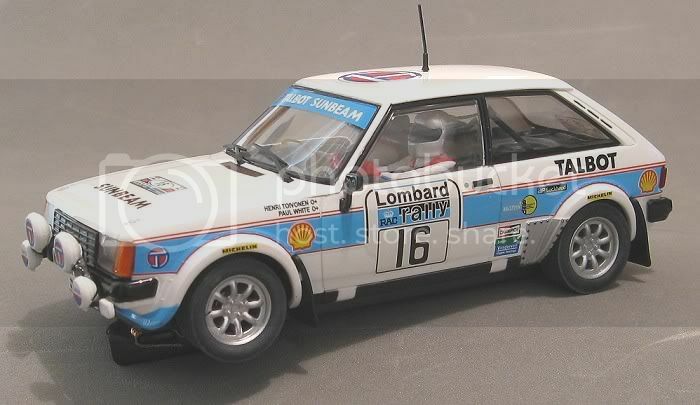 The French government in the form of Peugeot picked up the remnants of the Chrysler UK Sunbeam company, and the Sunbeam brand names, and marketed their new acquisitions as Talbot Sunbeam. 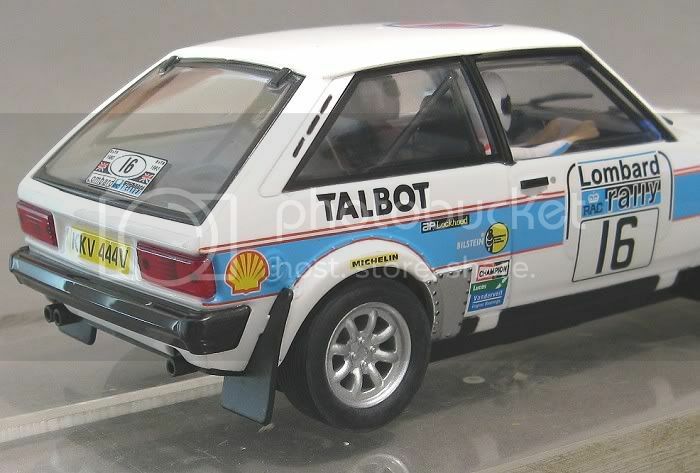 The Talbot Sunbeam subject matter was a brave new attempt by French and UK car manufacturers to revive a historic name to some sort of former glory, and with the help of Lotus they briefly held their heads high once again. Lotus reworked the engine in 1979 and by 1981 the car was appearing on the leader boards of international rallying. 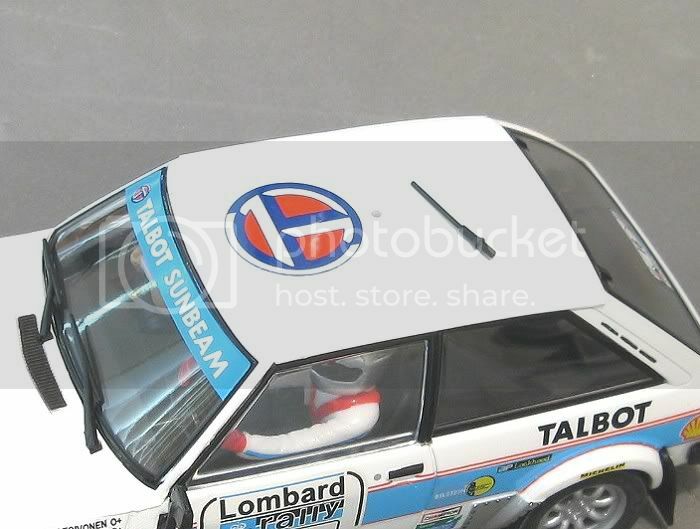 But the writing was on the wall and in this age of globalisation, the name Talbot, and Sunbeam, were destined for the records, no doubt to re-emerge at some otherwise undisclosed time in the future on one of the five inhabited continents……somewhere. 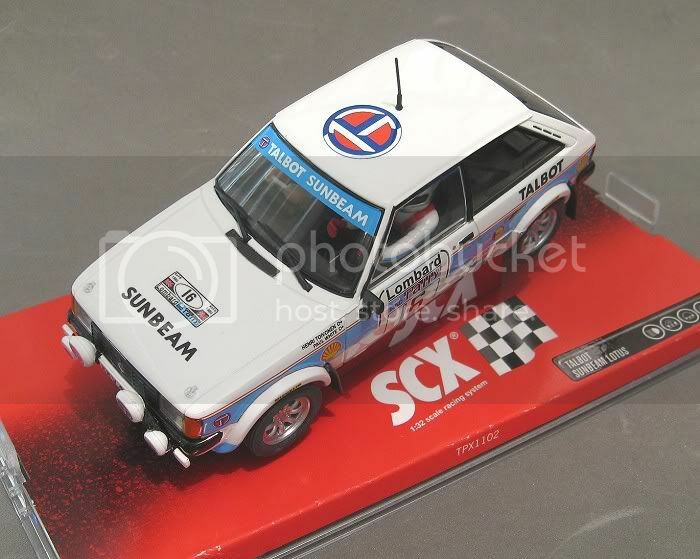 Well, after a preamble like that there has to be some sort of good news on the SCX front, and I am pleased to say that once again, there is!! Love ‘em or hate ‘em, it has now to be accepted that the quality of most SCX cars is among the mainstream. Because of their current tyre range and adjustable traction magnet, so too is their drivability! The only unknown factor left is the random way in which they seem to choose motors for their models. One minute we have screaming RX42B’s in their latest issue, then we get an old RX41 from out of the blue in something that deserves better. 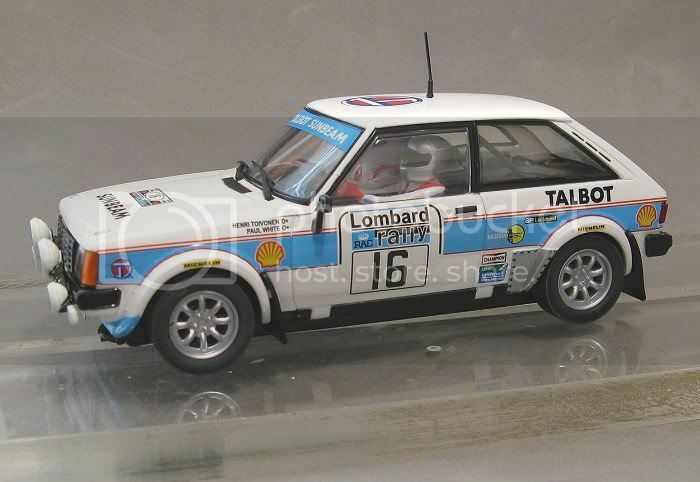 The Talbot is one of these models!! I know I have extolled the virtues of lower powered models in the past, especially the Ninco range with their NC1’s and the new NC8’s but this was because the models are inherently fabulous drives in non magnet, wooden track situations. SCX too in the past have made some great board track / non magnet models. The Ferrari F40, the Audi 90 GTO, The 90’s GP cars like the Jordans and the Ferraris and a host of others. But this model is not the same. No huge footprint and low centre of gravity to help it slip effortlessly round the trickiest of bends. The Talbot’s traction magnet is an essential part of it’s psyche. Away from the plastic piste it will languish in a morass of ‘also rans’ and ‘could do betters’. Yes, the plastic is its penchant!! Why so? 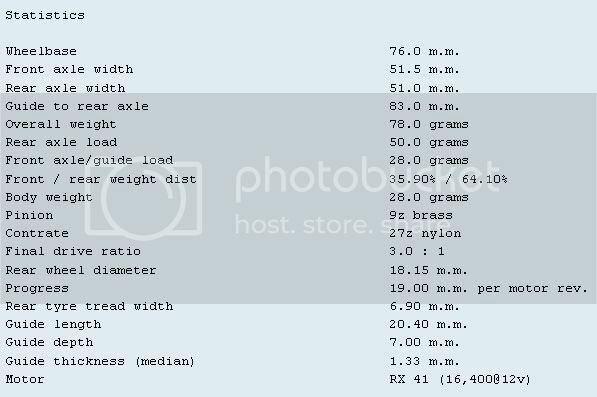 Well to start with, it weighs in at 78 grams which puts it the low side of average for an SCX car. The traction magnet and its adjustments need no introduction, I hope! And best of all, it has the new ultra soft ribbed rubber tyres it has been using for some little while now. They are ‘FAS’ tyres (fit any size). By that I mean that SCX have made them very pliable and elastic, and as a consequence, they are fitted to a whole variety of recent different SCX models and wheel sizes, to great effect. I first encountered them on the SEAT 131!! The grip in these tyres will allow the traction magnet to be raised higher than with other tyres, thereby improving acceleration and top speed. Apart from this, the Talbot has a couple of other good points. 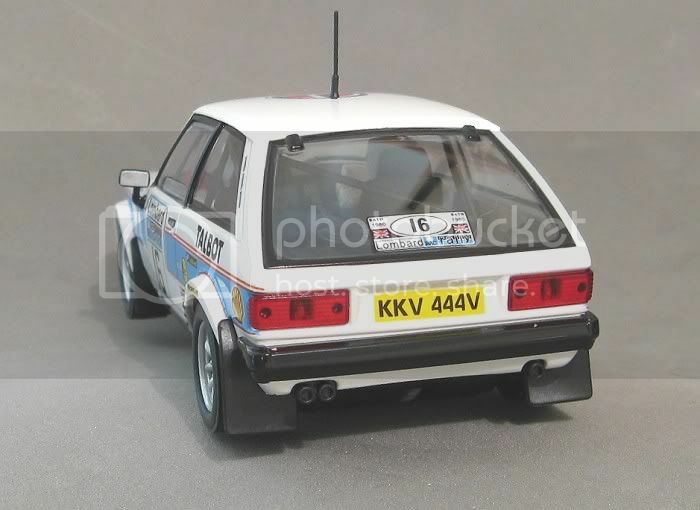 Firstly, not knowing whether I have said it about other models before, the finish on this model is better than excellent. The tampo is excellent, the clear lacquer is almost faultless and the colours are bright and distinct. Further more, there are no ‘sweaty Betty’ finger marks on the inside of the clear parts. No streaky screen that has been wiped with abrasive cloth before assembly and , wait for it, excellent headlights,…… again!! While other manufacturers give you non directional flat leds mounted on a flat circuit board which glow like St Elmo’s fire as you pass the landscaping. SCX still give you a nice round 3 mm led that throws a beam half way up the main straight! Exterior detail is with the best too. All around the model there is good detail (look, I’m smiling, and it’s not wind!) My favourites are the way they have reproduced the front driving lights. No crooked tampo or flimsy mouldings. The mud flaps too are beaut. Sponsor decals are crammed with accurate detail and even the UK registration plates are crisp and tidy, and….. the antenna is removable. No more little black dots in the centre of the roof after its third outing!! Hallelujah!! The body, with all the above and its pliant door mirror and wiper arms and everything else are its best feature. But the business end is not too far behind. SCX go back a decade or so with this model, chassis wise. Very simple and very plain. The motor fits directly into the chassis and isn’t loose. The typical SCX conductor strips run from the sprung guide to the motor contacts. The guide, yes, you’ve guessed, STILL ranks as one of the poorest in the market place! It’s a good size but oh so loose. A feature which must detract from its corner entry abilities. A huge plus though are the two chassis mounting screws. Ideal for a loose body situation if that’s your preference. The front axle sits directly in the chassis as models have done over the years. Well used models will see this slot wear through and the front axle become a liability in time so while the body is off it is essential that all points are lubricated. The front axle can take a drop of Vaseline, as can the sliding point on the guide. Through the bends it is just a case of gunning it and the lightness of the model is all forgiving. I only had the odd roll over deslot, but this was more due to the tyranny of distance to the far end of the track and my aging eyesight. A motor upgrade would see this model fly but the reality is that ‘flat out’ through the corners might have to be reassessed!! Other than that, the only thing I could mark down was the gear noise. This I rectified in the usual way with Tamiya fine plastic polish on my return home the same day. Lastly, just a tip on setting up SCX traction magnets. the track and every corner can be taken flat out!! til the model just starts to deslot when at the limit. 4. Lower the magnet a further quarter of a turn to minimise corner deslots. model to run a little hotter. This set up technique can be best done with a race management system operating, feeding back the variations in you fastest lap times with each adjustment. I had some good fun with this model and look forward to racing it as an underdog on plastic track sometime in the future. Our local technical tracks will see it’s not at too much of a disadvantage, I’m sure. As for non magnet board track racing, that has yet to be seen. 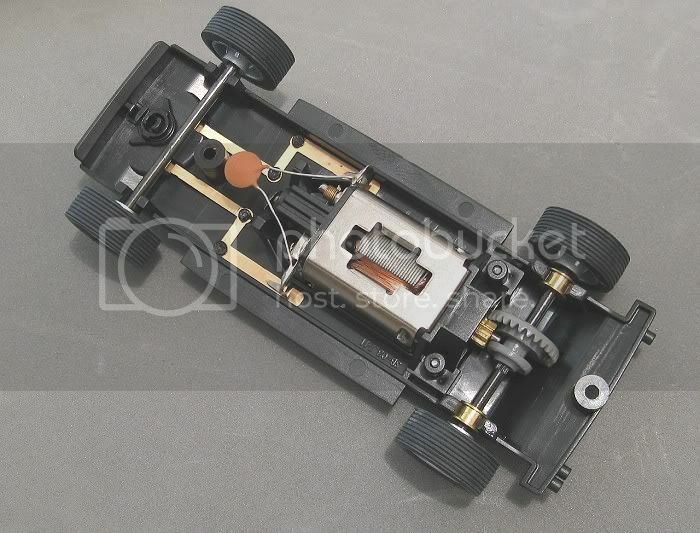 I suspect it will need a fair bit of weight and with other models in its class a lot more readily adapted to plastic non magnet, I don’t hold out any hopes of it being a board track race winner SOOB ! On its first race meeting I managed to take the car to fourth place out of thirteen in a group B Rally class on one of our local technical tracks, racing against Spirit, Fly, Scaleys and other SCX models. The only preparation apart from a lube job was the running in of the crown wheel with Tamiya fine paste and then lubricating with vaseline. 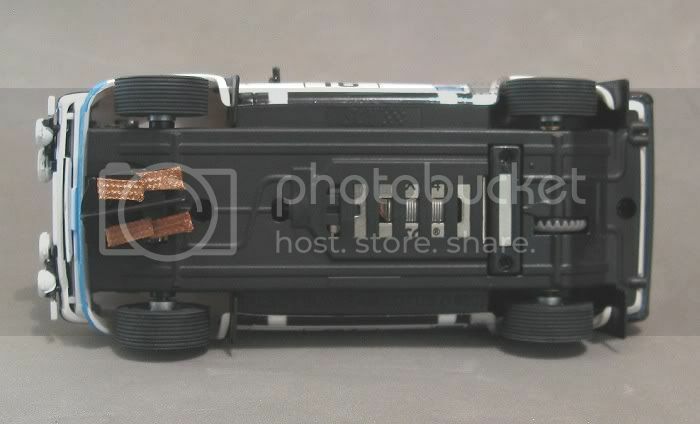 The unsanded tyres proved to have heaps of grip and just enough slip to allow the model a bit of slide in the corners. A more than pleasing performance.